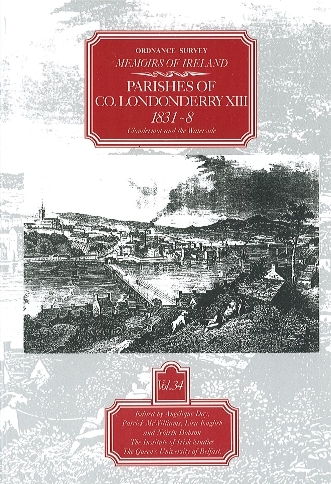 Ordnance Survey Memoirs of Ireland, Vol 34: County Londonderry XIII. This volume contains the Memoir for the parish of Clondermot, covering the Waterside of Derry city and the villages of Drumahoe and New Buildings, an area bordering Lough Foyle and encompassing part of the Faughan river and a large part of the estate of the Goldsmith's Company. Social economy is recorded by mills and agriculture, and occupations of the people cast light on everyday life in the city. Antiquities and history are equally recounted. The habits of the people are richly delineated through education and numerous societies, while an impressive dispensary catered for health needs. Together this material provides a unique insight into life in this area over one hundred and fifty years ago.